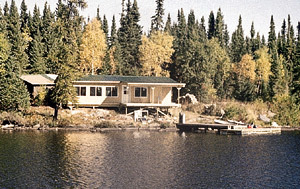 Lil Shab Lake | Northern Wilderness Outfitters Ltd.
A fantastic fishing lake with a brand new 3 bedroom cabin with large deck area, looking over the Canadian wilderness. This lake is located about 200 miles northwest of our airbase. We have the only cabin on this lake. 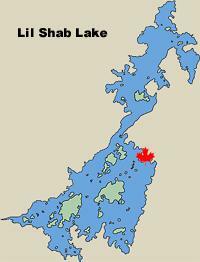 Lil Shab is noted for its great fast action walleye fishing and its big northerns of over 15 pounds. 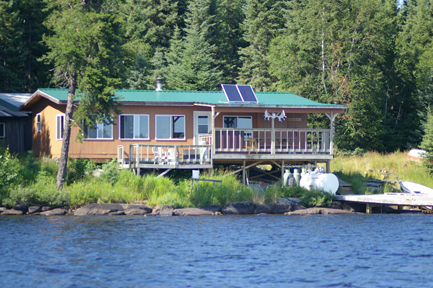 This comfortable cabin is equipped with 2 refrigerator/freezers, hot shower, running water, solar lights, comfortable lounge furniture, large kitchen table, gas barbecue grill, gas fish cooker, 14-foot boats with padded swivel boat seats, and other amenities to make your stay in the wilderness a time that will never be forgotten. For all those fishermen who want to catch some nicer size walleyes and northerns, Lil Shab will excite even the old-timers. 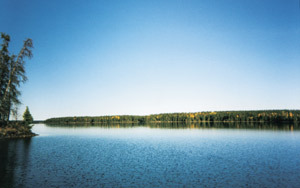 You can eat walleyes and northerns while at camp but no fish can be brought home from this lake.